In an earlier post, I discussed the need for designers to incorporate a wider range of ethnicities in video games. As to why they haven’t done so up to this point, and why the few non-white characters tend towards stereotypes, I offered up one possible explanation. Part of the reason for this is that a large number of games come out of Japan, which being nearly homogeneous in terms of ethnicity, and insulated – both physically and culturally – may lack a strong frame of reference for depicting a diverse cast of characters. Where the games are made in the Europe or the United States, where ethnic variety is more common, stereotypes may instead emerge as a consequence of one-dimensional writing. Perhaps a developer cannot be bothered to do the research into all of the nuance and idiosyncrasies that rise from a character’s ethnic experiences. While those developers who have at least made the attempt to be more inclusive should be acknowledged, it is more important to point out where more work needs to be done. I am almost six years late in discussing the case of Jade from Beyond Good & Evil, but an interesting post by Jason over at Microscopiq brought the issue to my attention. The post discusses the “first 11 black video game stars”, specifically those characters of visible African descent who were not only featured in games, but were the main character. Jade was amongst those mentioned. At a glance, some – if not most – people would question whether or not Jade qualifies as “black” in any sense. Arguments could be made for virtually any ethnicity as her appearance is quite ambiguous. The only solid support for Jade being a “black” heroine is in looking at the original concept art, which featured some earlier renditions of Jade with either locks or braids in her hair, and features more commonly associated with certain peoples of Africa. From the concept stage to the final version, much was changed, and we have a character who could pass for virtually anything. There are many possible reasons for the change, such as wider market appeal, as an ethnically ambiguous character alienates no one. It is also a truism that the mainstream beauty standard – set mostly by Americans and Europeans – is not inclusive of distinctively “non-white” features, particularly Africanesque features. For marketing’s sake – and this literally could’ve been a decision made by marketing against the wishes of the original designer – Jade could have been altered to resonate more with the mainstream. Looking at the final version, is it enough to say that Jade was intended to be “black” by the designer, or even that she is so in his/her mind, in order to claim her as such? I would say that it isn’t. Jade’s ethnic ambiguity alone, however, is not enough to dismiss her from the ranks of black heroines. After all, blackness is subjective, varying from place to place and culture to culture. If we take it to be synonymous with “African”, then the ethnic diversity of that continent means that Jade could look like anything. But here’s where we get to another important point. Jade is most certainly not African. Because she is not even from this planet. Beyond Good & Evil takes place on the fictional world of Hillys, where people like Jade are classified as “homo sapiens”, distinguished from other humanoid races such as “Capra Sapiens” (goat people), “Sus Sapiens” (pig people), and “Felis Sapiens” (cat people). The concept of race that divides human populations on Earth simply does not exist on Hillys. For that matter, there are no social divisions between any of the “Sapiens” – they are subclassified solely for the sake of compiling a photographic catalogue of all of the planet’s species. That is to say, these distinctions are biological, and do not manifest at all in the culture of Hillys. This is an important point, because the meaning of “blackness” on planet Earth is defined mostly in a social context. There are some vague overlaps into a biological context – some valid, particularly with regards to medicine, and some not – where genetics is cited incorrectly to support a social or political argument. Without getting too much into the meaning of blackness, there is the experience of so-called “black people” to be considered, which historically, and with few exceptions, tends to be one of hardship, oppression, social inequality, prejudice, and even dehumanization. This is particularly true of those peoples of Africa who were sold into slavery, and who even in the aftermath, have been forced to face social and economic handicaps. Coming back to video games, what would be required for a character to be considered “black”? Appearance could be one qualifier, but as we see in the case of Jade, this can become dubious due to the wide variety of physical characteristics that can be classified as “black”, a reflection of the extreme diversity to be found within such a vague and subjective category. The “black experience” could be another qualifier, as in a situation where a character is forced to face certain indignities, in spite of her ethnic ambiguity. There are undoubtedly women who resemble Jade and who have been forced to endure such conditions. In the United States, by way of the one-drop rule, it is common for a woman of fair skin to be deemed a “black” woman by virtue of her other features, and therefore share in the black experience. 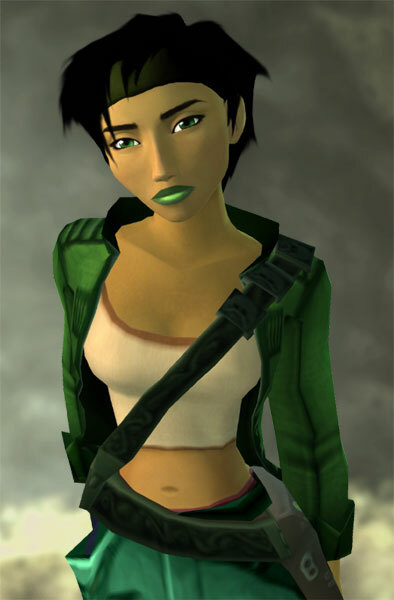 Jade as she appears in Beyond Good and Evil, however, fails to meet either of these qualifiers. The only remaining qualifier brings us back to the designer’s intent. Without speaking to Michel Ancel or his art team, we cannot know which ethnicities inspired Jade’s appearance from original concept to final incarnation. Perhaps then, we could derive clues from the voice actors chosen to play Jade. We have to take this with a grain of salt, however, because the ethnicity of voice actors do not necessarily match those of their characters. Cree Summer, who is African-American, is one of the most prolific voice actors in the field, and because her voice does not invoke any particular ethnicity, she has been tapped to play a wide range of characters – most of which are not African-American or “black” in any sense. She got her start playing Penny from Inspector Gadget. What this suggests about the willingness of game producers to cast black actors for their voices versus their willingness to craft black roles may be another subject worth exploring. As for Jade, since the game was released in different languages, she was played by several different voice actors. But with respect to how Jade’s voice corresponds to her ethnicity in the mind of the developer, we should take a look at the actor closest to the developers – Ubisoft Montreal – which would be the one cast for Jade’s French voice. Her name is Emma de Caunes, and thanks to the artist John Karp, we can see her picture below modified to resemble Jade. Even had Jade’s voice actress been of any French-African ethnicity, it would’ve been a stretch to therefore consider the character as being of any African ethnicity. The example of Cree Summer demonstrates the distance between the identities of voice actors and their characters. In any case, Emma de Caunes is not of any visible African descent, and therefore we cannot use her ethnicity as a case for Jade’s “blackness”. This brings me to my final point about Jade, which is that in spite of the developer’s original intent, any ethnic inspiration for the character, how Jade is perceived by her audience may be even more important. By looking at a few random samples of fan-created art for Jade, we can gain some insight into how others perceive her ethnicity. 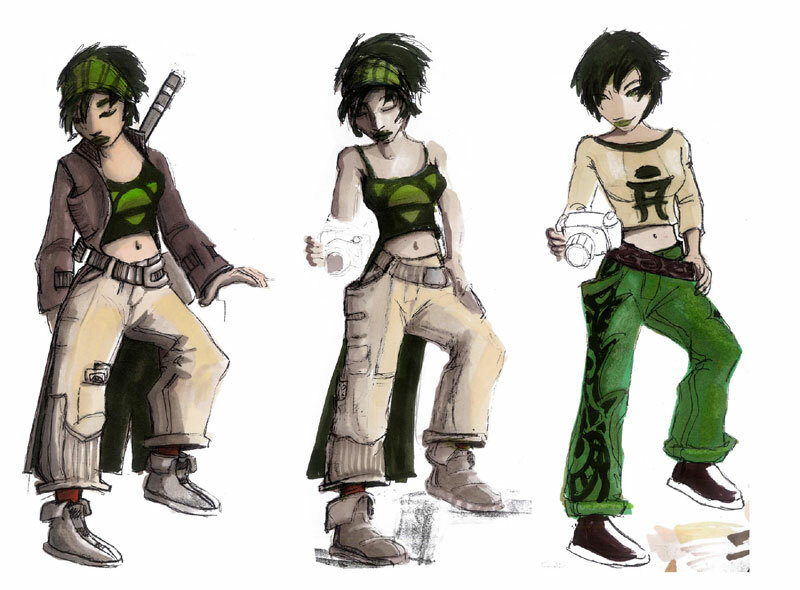 An extensive spread of Jade fan art can be seen at the deviantART Beyond Good & Evil Fan Club, where not one rendition depicts Jade with Africanesque features. Because an artist’s work will necessarily be based in part on their personal experiences, and probably in some way reflect the artist him or herself, it stands to reason that the artist’s own ethnicity may factor into how they depict a character. What we see is that in spite of the varied ethnicities of the artists, not one of them depicted Jade with features any more distinctively Africanesque than what we see in the official Ubisoft rendition. Had these artists had even an inkling that the developer intended Jade to be “black”, then it may have been more likely that we would have seen that understanding reflected in their work. While we cannot discount the possibility that Jade’s features would’ve been “de-ethnicized” even had she been more clearly Africanesque – as is common amongst fan artists of Storm from Marvel Comics – we can at least say that nothing about Jade seems to encourage fans to depict her as “black”. So in the end, based on overwhelming evidence, we are forced to conclude that Jade from Beyond Good & Evil is not “black” in any sense of the word. For the reasons discussed above about how races are defined, and how they do not correspond to any human categorization on the planet Hillys, she cannot accurately be considered “white”, “Asian” or any other race/ethnicity from Earth. She can only barely be classified as human, being a “homo sapien”, but those who have played the game also know that she is a little something more. I’d like to count Jade amongst “black” female protagonists in video games, due to the fact that there are otherwise none, but doing so actually sets a weak precedent. It is not enough to be inspired by Africanesque features, only to see that inspiration disappear for the sake of market appeal. 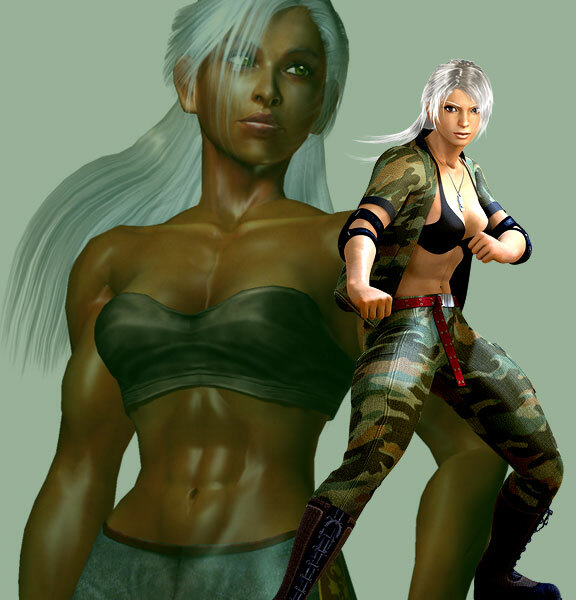 And it is regressive, if not plain insulting, to create a character of color – in terms of background and appearance – only to completely undo it in a future incarnation, as in the deplorable example of Vanessa Lewis from Virtua Fighter. Note the lighter skin, thinner lips, altered facial structure, and reduced hips from the Virtua Fighter 4 version (background) to the Virtua Fighter 5 version (foreground). As technology improves, and as the content of games expands in terms of breadth and depth, opportunities only increase for representing diversity. In the future, it will not be enough for a character to have darker skin, thicker lips, or a different eye shape. We will have to see different cultures and experiences represented as well. This wouldn’t have to be a limitation with regards to restricting the game setting to Earth. After all, there is always interstellar or cross-dimensional travel. There is also alternative history. And already, plenty of creators have told stories of other worlds, only to draw inspiration from the experiences of the peoples of Earth, because doing so adds a certain richness and believability. As I discussed in Ethnic Depictions in Video Games, there has been a want for protagonists of color with which gamers of color can identify. If gamers cannot identify on a superficial level – i.e. by appearance, if they cannot identify on the basis of a common social experience, and if they cannot identify by way of voice, then there is little remaining to connect them to the character. For most gamers this probably will not taint their experience with a game, as the lack of inclusive ethnic representation has become the norm. But there is certainly a call, albeit muted and scattered amongst the more thoughtful pockets of the gamer population, for game developers to be more inclusive in their thinking.